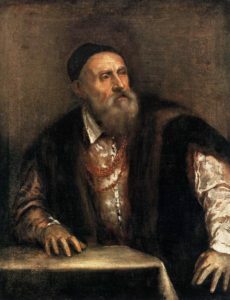 From 1516 until his death in 1576, Tiziano Vecelli or Tiziano Vecellio, known in English as Titian, was the undisputed master of Venetian painting. He is to color (colorito) what Michelangelo is to drawing and sculpture (disegno). Titian’s complete mastery of oil painting in religious and mythological scenes and in portraits resulted in the 1530s almost exclusive private comissions from royalty- the Emporer Charles V and his son Philip II; and from the Pope, Paul III. This lecture will survey his splendid paintings and introduce examples of those by his followers, Veronese and Tintoretto, and address his later influence on Rubens and Velasquez. Eleanor Sypher is the former Executive Director of The van Ameringen Foundation in New York. She holds a doctorate degree in Greek and Latin from Columbia University and a bachelor’s degree in English with a minor in Art History from Smith College. Prior to joining The van Ameringen Foundation Eleanor taught Greek, Latin, English and Mythology at private high schools in New York. She was also a founder of The Bronx Charter School for Children (K-5th grade), located in Bronx, New York. A $10 contribution is requested to attend the presentation and enjoy the beverages and hors d’oeuvres provided.